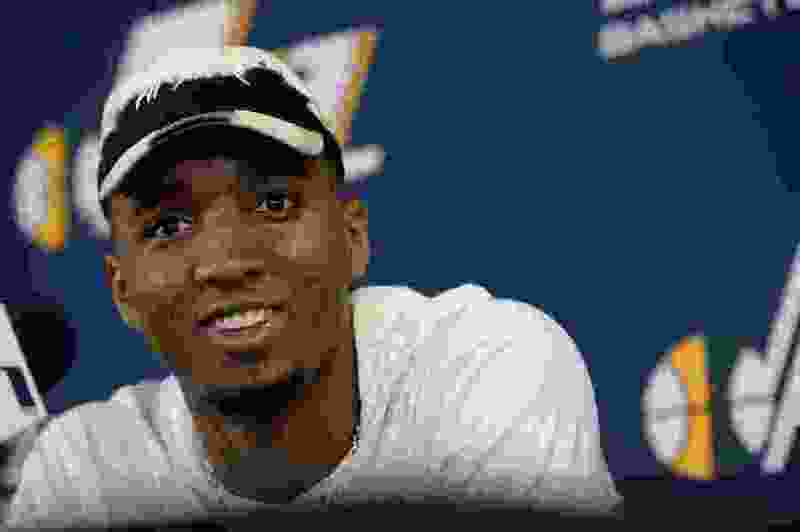 (Francisco Kjolseth | The Salt Lake Tribune) Utah Jazz guard Donovan Mitchell speaks with the media during exit interviews at the team's practice facility in Salt Lake City Wednesday, May 8, 2018, after losing to the Houston Rockets in Game 5 of their Western Conference Semifinals during the 2018 NBA Playoffs. “I think I can recruit some guys — why not? — to play with us. You look at what we’ve done. You look at how we move the ball. We play with guys who don’t care who scores the most, who rebounds the most, who has the most this, the most that. We play with guys who genuinely want to win. When was the last time you heard a Jazz player talk like that? Stockton didn’t. Malone didn’t. Dantley didn’t. Boozer didn’t. Williams didn’t. Ostertag didn’t. Billy the Whopper Paultz didn’t. Hayward most certainly did not. What Donovan Mitchell said to Adrian Wojnarowski during his recent ESPN podcast was more than a reflection of the way things work in the modern NBA, it was, for around these parts, singular, significant and nothing short of spectacular, an appropriate follow-up to a remarkable rookie season. Such confidence this kid has, and swagger and nerve and … well, cool. The Jazz have never had a player with the combo-pack of talent and charisma, the tethered status and charm necessary to influence what free agents of import might at least consider doing — coming to play in Utah. And his recruiting pitch was more than an empty sell. It might have been a tad-bit overcooked, but hollow? No way. If Mitchell’s sincerity were a swinging hammer, it might have knocked out somebody, dropped him flat, so Mitchell could drag him here. He actually believes what he’s saying. He said the Jazz have great young players, players who care about one another, who care about what’s most important and who couldn’t care less about who gets his name in tomorrow’s headlines. He hinted at what he earlier has said, essentially that the Jazz are on their way, one way or another, to contending for an NBA championship, and that (fill-in-the-name) could help facilitate that title taking, that the opportunity was and will be there. Just call Quin Snyder when (fill-in-the-name) is ready to get down to business. Mitchell also said, in his college days, he swayed three or four guys to come to Louisville, and that he learned a few recruiting tricks from Rick Pitino, a live-and-let-learn prospect that likely scared the bejeebers out of Jazz fans and caught the attention of federal investigators. Who knows? The one hazard in Mitchell’s exuberance is the potential perception by important, contributing, existing Jazz players that he is recruiting over them, looking for an upgrade. On the other hand, he is hip and sophisticated and sweet-faced enough to smooth over the ruffles. His targets now are notable ones. Paul George? Are you kidding me? When was the last time a free agent of that level was even whispered about for the Jazz? Is there an echo in here? Never. That’s when. And while Mitchell, and by extension, the Jazz, probably won’t land George, anybody who scoffs or laughs at Mitchell’s enthusiasm, his intelligence, his intentions, his talent, the power of his persona, should do so at their own cynical peril. The antiquated notion of you-go-live-in-Utah-I-don’t-want-to, ignited again when Hayward left, is being swept away, much to the credit of people originally from the outside who are now Jazz insiders — Dennis Lindsey, Snyder and Mitchell, among others — who upon arrival circled the positives of the organization, its leadership, and the city and the state, its fans, and are now making those positives known. There are a number of quality players who would like to play for Snyder, given the proper chance. That’s not rumor, it’s fact. Add in a 21-year-old presence like Mitchell, who already has been embraced by some of the game’s biggest stars, stars who are impressed by his game and the force of his infectious manner and Kobe-esque drive, and the power of that cannot be ignored. I said four months ago that during Mitchell’s time with the Jazz, within the next three or four offseasons, they would sign a significant free agent, in large measure on his account. I had no idea his campaigning would be so open, so overt, and so soon. He hasn’t landed Paul, and likely won’t. Vegas says he won’t reel in LeBron James, listing the Lakers, the Sixers, the Rockets, the Cavs and the Spurs as the five favorites there. But, like Lindsey said, the draw of players on players In the modern NBA is huge. There are other factors, too. But if you were to lay down a bet on whether the Jazz will sign a big-name free agent within the next fistful of offseasons, with Donovan Mitchell leading the way, where would your money go? Unlike Derek Harper all those years ago, it would go to Utah, to the team with the ridiculously and irresistibly and irrepressibly confident kid.